A writing surface for the youngest school children! Dry erase boards and chalkboards allow teachers to present curriculum in a manner that appeals to students who are part of large classrooms. They also allow students to take turns improving their scholastic expertise. However, some dry erase boards and chalkboards are just too tall for younger children to reach. This is why teachers who instruct young children should consider ordering the Kids Chalkboard. The 36 by 22-inch combo board sits at a young child's eye level, giving him or her access to draw or compute simple math problems. 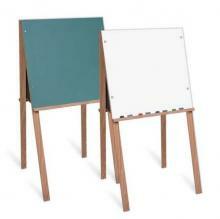 Strong oak legs support the dual sided Kids Chalkboard and solid oak trim supports the writing surfaces. Teachers love this board because it allows two children to participate in class discussions simultaneously. This highly durable combo for young kids carries a 50-year warranty and it provides young children with a lifetime worth of school memories.